Almotamar.net, Google - Today, Friday was the latest round of confrontation between Iran's ruling regime and the so-called "Green Wave" of opposition challenging President Mahmoud Ahmadinejad. The Quds Day rally, an annual state-sponsored event to express support for Palestinians, became a cover for protesters looking for ways to demonstrate after their own anti-government rallies were banned. Millions marched in the streets of Iran, according to state estimates, with two groups mixed in massive crowds. Ahmadinejad supporters chanted "Death to America" and "Death to Israel," while YouTube videos showed anti-Ahmadinejad protesters wearing to protest, and the Revolutionary Guards Corps vowed a swift crackdown. 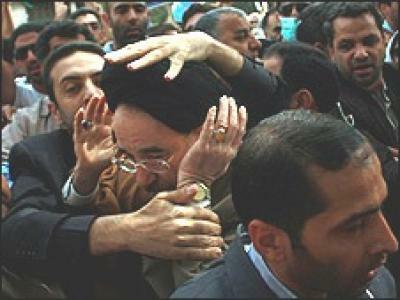 By midday there were reports of limited clashes, including assaults on former president Mohamed Khatami and Mir Hossein Moussavi, whose loss in the last presidential election triggered nationwide demonstrations claiming the Adhmadinejead had rigged his reelection.